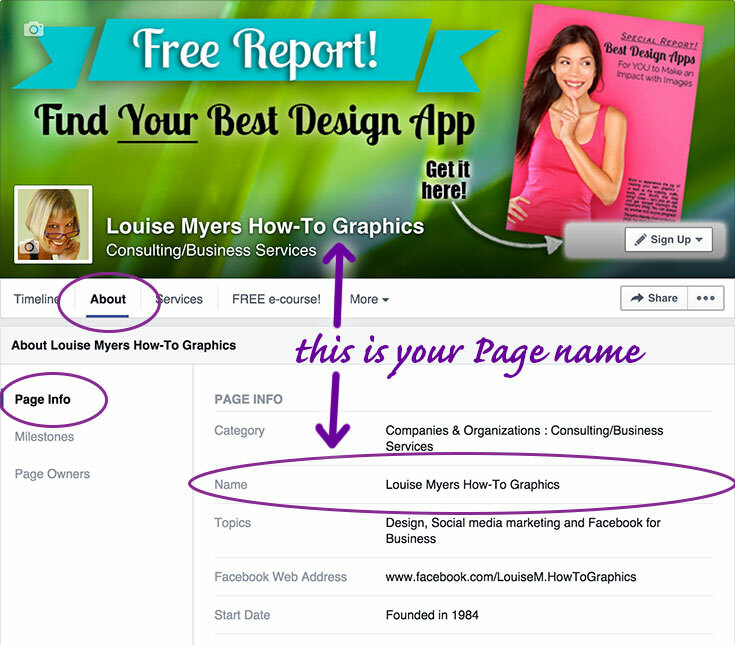 Here is how to change your Facebook Page name in 2017. The good news is you can – probably. Now it’s quite easy to change your Fan Page name. But – Facebook will have to approve your name change. You can only change once. A reader has offered a hack even if you’ve already changed your name once. See end of post – caution is advised. NOTE: When I speak of Page name, I mean the Title of your Page, as overlaid on your Cover Photo. This will NOT change your Facebook Page URL (web address). 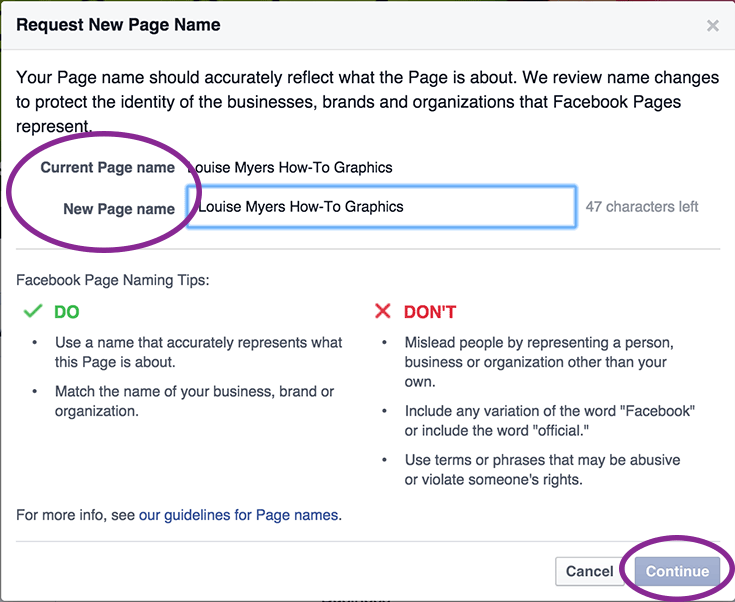 Check here for how to change your Facebook Page URL and important cautions about doing so. Changing your Page name is a BIG deal – it must be done right – you can never change it again(through normal channels, anyway). Please read this entire page carefully! Logged in as an Admin of the Page you wish to change, click About under your cover photo. You should be on the Page Info tab. Click it in the left sidebar if necessary. Hover the Name section and click the blue Edit pencil that pops up to the right. Fill in the name you’re SURE you want (WARNING! Cannot be undone or changed more than ONE time!). Then scroll to the bottom and click Continue. Check your spelling again. Once you click Request Change, your request will go to Facebook for approval. See below for another possibility. I changed my Page Name in 2013, so I don’t know if this option is still available. But I’m leaving it here so you can try it. Let me know! If you’ve never changed your Page name, but still don’t see the Edit pencil, try changing your Page category to Brands & Products or Companies & Organizations, and click Save Changes. The Request Change link should magically appear! Now click Request Change and fill out the form (sample below). Note that you have a choice of reasons for the Page Name change request. If you select that your business name has changed, you will almost certainly be required to provide documentation. Logos, business cards, and websites are not acceptable. You can choose “Other” and explain in the text area. My first choice was to change my Page name to match my website: How-To Social Media Graphics, and explain in “Other” that my business had evolved. I decided that had a high risk of being rejected. 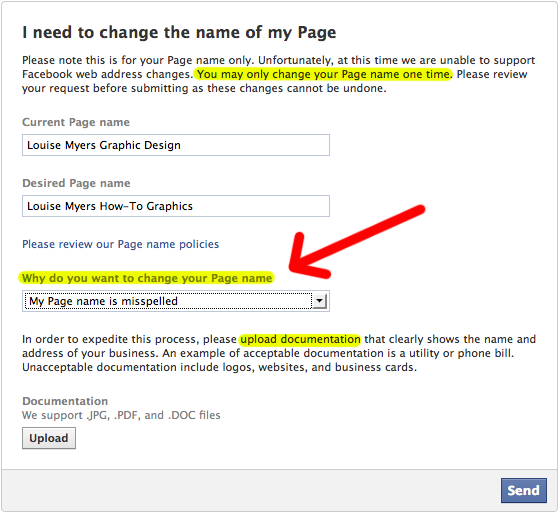 Note: Hyphens (as shown in the screen shot) are no longer allowed in Facebook Names – either Page or personal profile. This is the Page name you want for the life of your Page. At this time, just ONE change is allowable. Your Fan page is 100% compliant with Facebook Terms of Service. Your Page could be shut down once it’s scrutinized by Facebook. Click with caution! Upload any pertinent documentation, and click Send. You should get an auto-reply quickly. I can’t say how long it will take for Facebook to review your request and respond – the auto-reply says up to 3 days. For me it only took one day plus a half hour. And it was approved! Here is a hack offered by a reader. CAUTION: I don’t know what “Global Pages” are, and if this is something you should do. Proceed with caution. The creator of the SlideShare offers to answer questions – you can contact him via the info on slide 11.